Supporters: Two wyverns wings elevated, tails nowed Vert, vomiting flames Proper. From the place name Aberbothenoth, which lies on a narrow peninsula on the north side of the river Bervie. On the north east side the land falls steeply down to the burn, once called Buthenot, and on the south side it slopes more gradually down to the river Bervie. "Aber" means the influx of a small stream into a greater stream. "Aber" can also mean "mouth of" as in Aberdeen. 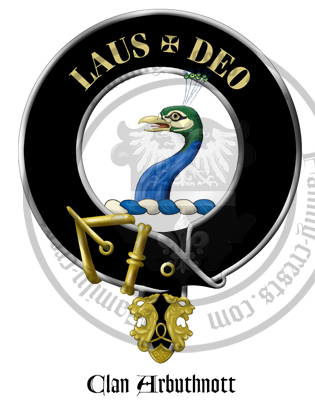 "Both" or "Bothena" is a baronial residence. "Nethea" has been described as the stream that descends or is lower than something else in the neighbourhood. 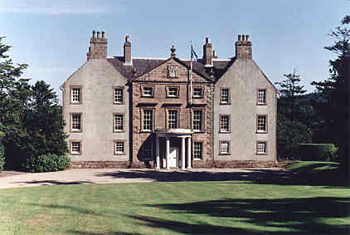 Arbuthnott House and surrounding estate of around 3,000 acres (12 km²) remains the seat of the family today. 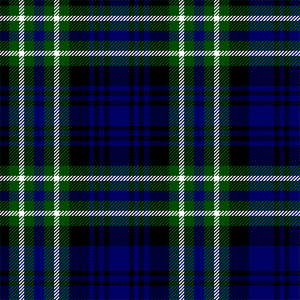 Tartan: The Arbuthnott tartan was registered with Lord Lyon in 1962 and was inspired by the tartan of the Black Watch.